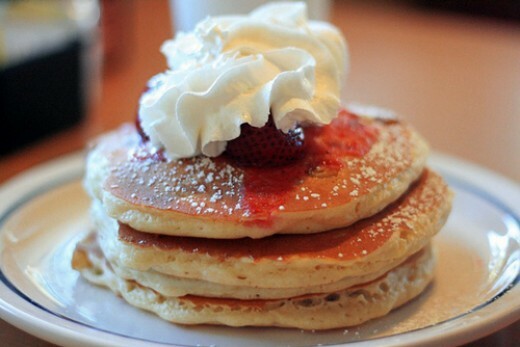 These pancakes from the International House of Pancakes are loaded with creamy, rich cheesecake pieces and topped with a strawberry topping, powdered sugar and whipped cream. Read on to learn how to make these at home. This recipe comes from the test kitchens of Betty Crocker. They played around with different ingredients and came up with a recipe that is very similar to the cheesecake pancakes served at International House of Pancakes. Slice the cream cheese into four pieces and freeze overnight. Preheat a skillet or griddle on medium high. In a large bowl, combine all the other ingredients. Cut the cream cheese into small bite size pieces and add to the batter. Spray a skillet or griddle with cooking spray. Add 1/3 cup of batter and cook on both sides until done.